Since taking the helm at Balenciaga, designer Demna Gvasalia has taken the iconic house into the Instagram age. Each season, his collection is jam-packed with eye-catching details. From the iconic over-the-knee knife boots to pieces inspired by none other than Bernie Sanders, Gvasalia seems to capture a cultural moment with both edge and elegance. For spring 2018, the designer is transforming styles you may have written off in the past years, bringing them back into the spotlight. Models walked the runway in embellished platform Crocs in a range of hues. 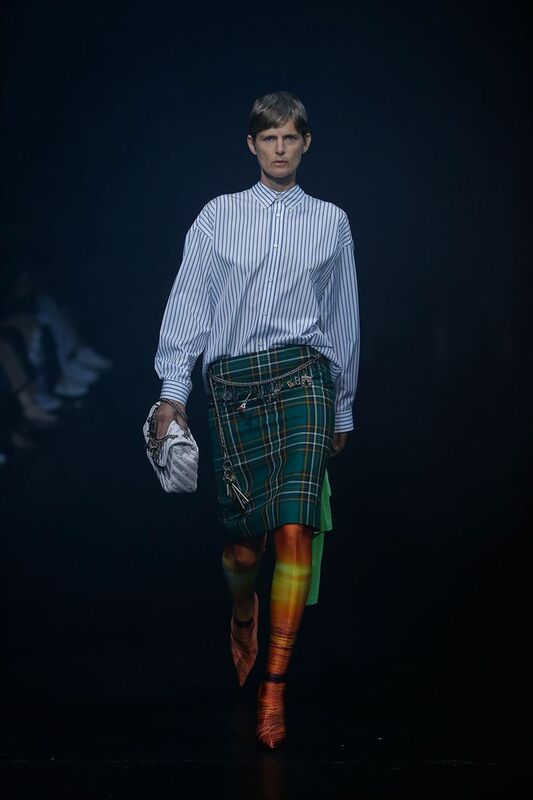 Then, Gvasalia debuted a new take on leggings, sending printed legging-boot hybrids down the runway, layered under dresses. Union Jack and dollar-bill motifs were particularly attention-grabbing. Suffice it to say every fashion girl will be clamoring to get her hands on these pieces for spring. Read on to see the collection in full! Will you wear these trends for fall? Let us know in the comments!